BioGPS now supports Xenopus tropicalis genes! For those who aren’t familiar with Xenopus, it is a genus of aquatic frogs native to sub-Saharan Africa. 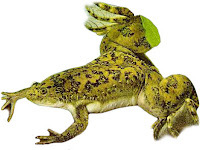 Xenopus laevis has long been used as a model organism in developmental biology, while Xenopus tropicalis is being increasingly adopted for its amenability to genetic studies. Now you can search BioGPS for frog genes (e.g. wnt4, NM_001008135, ENSXETG00000004742) giving you quick access their gene reports. Looking for a frog-specific gene identifier? Check out the popular Xenbase ID, listed under “Accessions” in the Gene Identifiers plugin (our classic blue and yellow table on the default layout). Craving more data? We’re excited to announce that Xenbase is our first frog plugin, a biology and genomics resource for both Xenopus laevis and Xenopus tropicalis. And as always, you can augment the default report layout with any number of plugins from the extensive plugin library. We got the ball rolling, but our team is new to the Xenopus world. Do you know a good web resource for frog genes? Help us out by registering it as a plugin! It’s very easy and takes less than 5 minutes. You can now use Xenbase IDs (e.g. “XB-GENE-1001990”) in plugin URL templates, along with any of the 24 other supported identifier types. If you need help or don’t want to do it yourself, just shoot us an email with the URL. If you work with a model organism that you’d like us to support, let us know! We’re always on the lookout for feedback and ideas from the community. We have more great features coming down the development pipe. Sign up for the email, subscribe to our RSS feed or follow us on Twitter to get the latest. See you next week!